Check it out! Made the news a few times today. This is from Ocean 100. The students at St. Jean Elementary School in Charlottetown will be getting new playground equipment thanks to the efforts of the Home & School Association, parents and volunteers and the Rotary Club of Charlottetown Royalty. Details were announced the students in a school assembly. 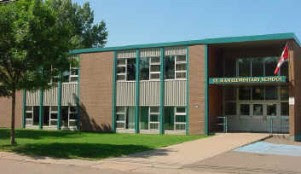 St. Jean is one of only 30 schools in the country to receive a Helping Hand Award from "Let Them Be Kids" organization. Building costs are expected to be $100,000 for the new playground. Cathy and Erin Hennessey are the building co-chairs. Erin says the project began with a simple idea of maybe adding one piece of equipment like a slide but grew into something much bigger. Fundraising has begun and for every 50 cents raised, it will turn into $1.00 for the project. A major fundraising event is set for March 29th at the Delta. Students will decide what playground equipment they want on February 2nd. Build day is May 26th. There are 143 students in the school this year. The playground equipment in use at present is about 20 years old.